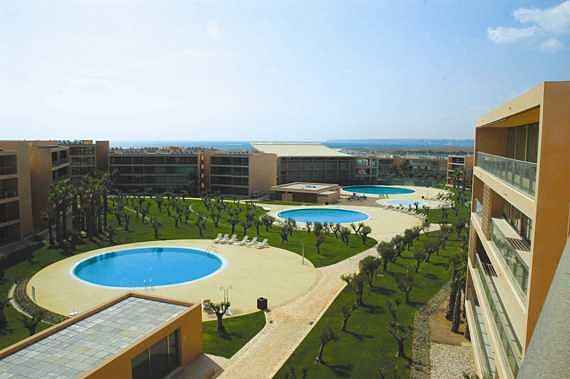 Modern and comfortable apartment in the Ground Flor or 1st floor in a new building, only 2 minutes walk from the beach. Three rooms (2 single beds, 2 double beds), 2 bathrooms, fully equipped Kitchen, living/dining-room with cable TV, air-conditioning, Linen and Towels included. A Large balcony with Swimming-pools view. Inside of the Resort you have 2 Restaurants, 2 Bars, Golf course, 7 Swimming-pools (2 for Children), 1 indoor swimming pool and gimnasium ( Free acces to this facilities ), golf course, tennis court, Kids Club, garage, security 24 hours a day. Within n a short distance the beautiful Salgados beach. Supermarket 150 meters away. Daily Cleaning services included with daily change of towels and change of linen twice a week. Deze woning kan niet online geboekt worden. Wel kunt u een boekingsaanvraag versturen naar de eigenaar, met de data waarin u geïnteresseerd bent.